Paul Newsome and Adam Young are running a series of our Three Day Coach Education courses in the UK in July and August, in Loughborough and Cardiff. If you are an aspiring coach looking to seriously develop your swim coaching and video analysis skills then don't miss out on this opportunity. 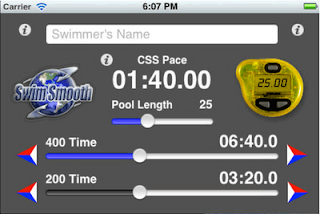 If you have a Finis Tempo Trainer or Wetronome Mk2 then Swim Smooth Coach Steve Casson has written a great app for your iPhone or iPad. Given your 200m and 400m times, the app will calculate your CSS pace and then tell you what time per lap to enter into your beeper to pace you out perfectly! The app also includes a stroke rate stop watch, so you can measure strokes per minute accurately. Very neat and totally free! More more information see here, or search for Swimulator+ in the app store. If you're quite new to swimming freestyle, you might well struggle with your breathing. You might be taking on water when you try to breathe or feel desperately out of breath and have to stop for a rest at the end of each length. As you start to take a breath, your lead arm should still be out in front supporting you. If it sinks down in the water with little purchase then your mouth will sink below the surface and you'll take on water. At this point of the stroke you're naturally thinking 'give me that air' and nothing else! The key is to let your breath take care of itself and keep your focus on the support of the lead arm instead. To help with this, try repeating this mantra to yourself: 1-2-Stretch-1-2-Stretch where the 1 and 2 are on normal strokes and the stretch is on a breathing stroke, reminding you to keep that lead arm stretched forward for support. 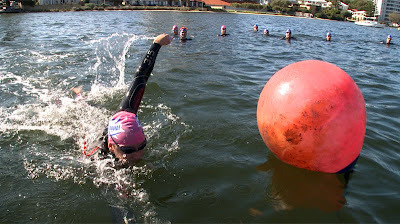 If you have a tendency to pause and over-glide in your stroke then be wary of leaving this arm stationary for too long or you risk stalling. Just stretch and feel like the focus is on that lead arm and not on breathing in. If you found this tip helped your breathing then take a look at our Bambino Swim Type and see if it rings any bells with your stroke. The Bambino Stroke Correction Guide (here) will give you plenty more tips to improve your swimming, all tailored to your specific stroke style! This looks a bit like Popeye chewing his spinach, which is where the technique gains its name from. Breathing in this way helps you keep your head lower without taking on water, which is important as lifting the head too far causes your legs to sink downwards. 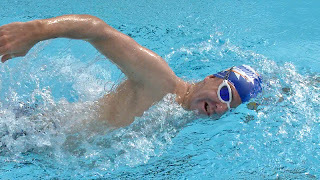 Any Swim Type can benefit from Popeye breathing but particularly those new to swimming. Yes they're finally here, the new HUUB Wetsuit range is now on sale, just in time for the triathlon and open water swimming season! Using our deep knowledge of individual stroke styles we designed suits to perfectly match your specific stroke whether you are a leg sinker, naturally buoyant, a strong kicker or experienced swimmer. Select the right model and buoyancy profile, and you'll immediately feel at home, swimming quickly and efficiently with the suit complimenting (and even improving) your stroke technique. 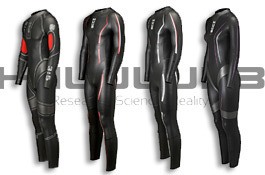 The suits were co-designed by world leading Sports Science Professor Huub Toussaint using the very best materials and construction possible, guaranteeing you the slippierest suit possible. This man knows the secrets of what makes a suit really fast having worked with Olympic Gold medallists to study and select the speedsuits that have dominated the last few Olympiads. Last by not least, the HUUB design triangle is completed by Dean Jackson, a man with 22 years of experience in the wetsuit and triathlon industry. He's the experienced and sensible one - making sure each design concept is well conceived, thought through and constructed using the very best methods and materials. All the hard work is done and the result is an exceptional range of wetsuits packed with new design concepts that are set to revolutionise wetsuit design forever. For more information and to purchase, see here.